I'm launching my new baby, Radioactive Mushrooms in the Forest, tomorrow at the Aimless Booth (C2) at Art in the Park! 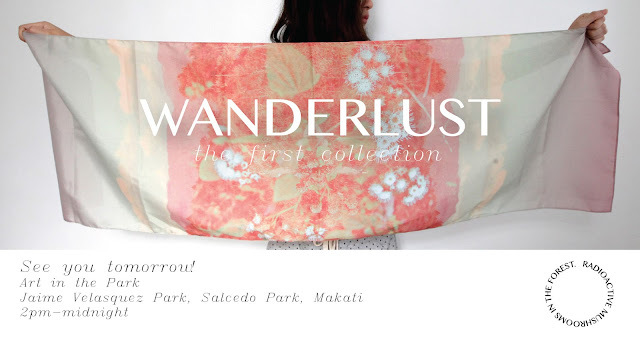 The first collection is called Wanderlust, "contains a series of scarves that flaunt carefully curated personal photographs acquired from various trips around Asia, mostly from islands in the Philippines. They are created with sentiments of wanderlust, the longing to be out there when we are in here. We hope that these scarves transport you transcendentally to where you want to be." These are photos I personally took from my trips to Batanes, Sagada, Baguio, Cambodia and more. Each design will be limited edition prints; we will be printing only 10 of each! Tomorrow at the fair I will be releasing some scarves with photos from Batanes, Sagada, QC and somewhere up in the air. I hope to see you there!